Gaia, complete with its sunshield, could not be transported in the container that originally brought it to Guiana. 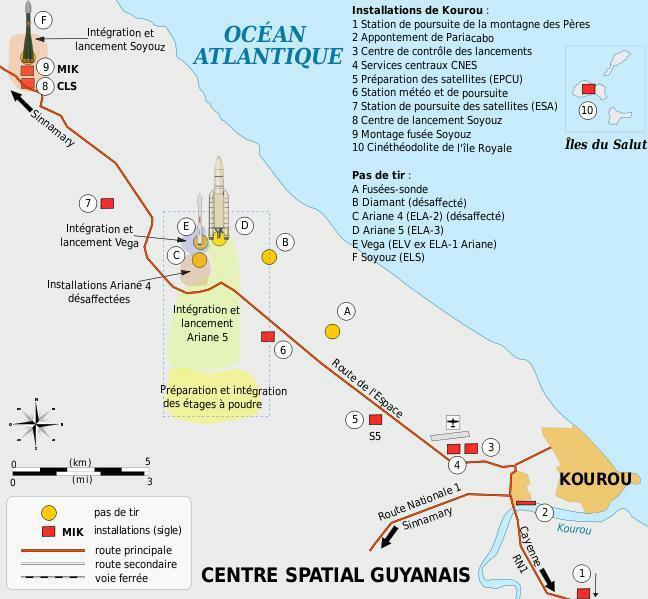 Instead, it was transported between the buildings in the Conteneur Charge Utile 3 (CCU3). This container is effectively a self-contained cleanroom: it is air conditioned, the temperature, humidity and dust are controlled, and obviously it is waterproof. It is a large container, big enough to fit all kinds of satellites, including Envisat, one of the largest satellites ever built, or the ATV. 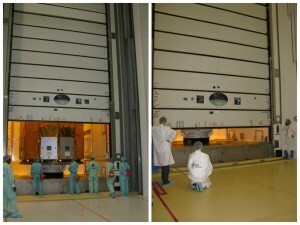 A few days before the date of the transport, the CCU3 had to be mounted in the entrance airlock of the S1B building (the point where Gaia entered in August). It was checked to ensure it was completely waterproof and the interior of the container was cleaned thoroughly. 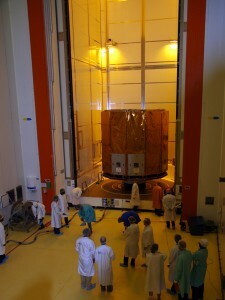 A few hours before the transport, the satellite was placed on the removable base of the container. 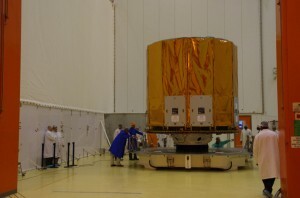 Two hours before Gaia was due to be moved, the base and the satellite were rolled into the container. Once the satellite was inside, the door of the container was closed, the air conditioning was turned on, and the internal environment was monitored carefully. 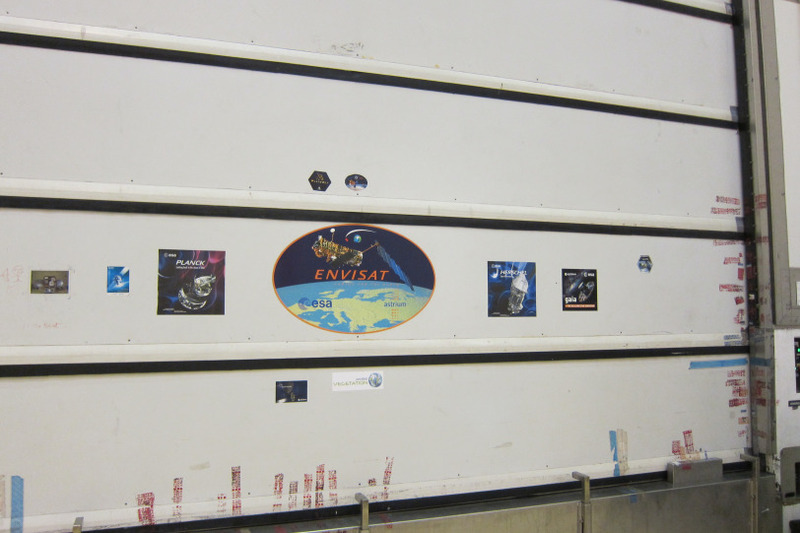 On schedule, the container was taken out of the airlock and it was time for the convoy to hit the road. 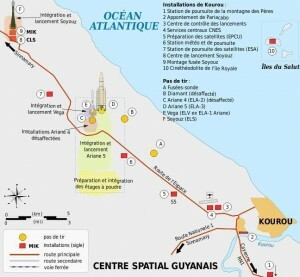 It’s a journey of around 5km between the two buildings and the convoy travelled between 10 and 20 km/h. That evening, Friday 29 November, it took less than an hour to make the journey. Even at 19h13, the temperature outside was still 28 degrees. A few raindrops fell along the way, but fortunately it was not a tropical shower. 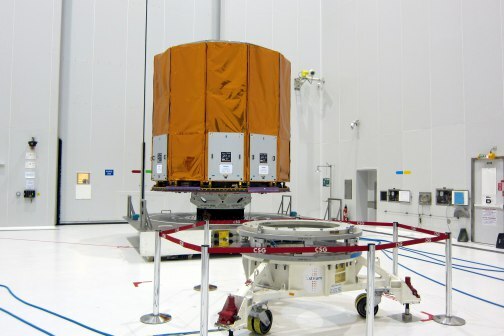 Arriving at S5, the CCU3 was placed at the entrance to the airlock. 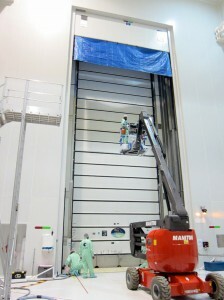 The exterior door of the airlock was opened. 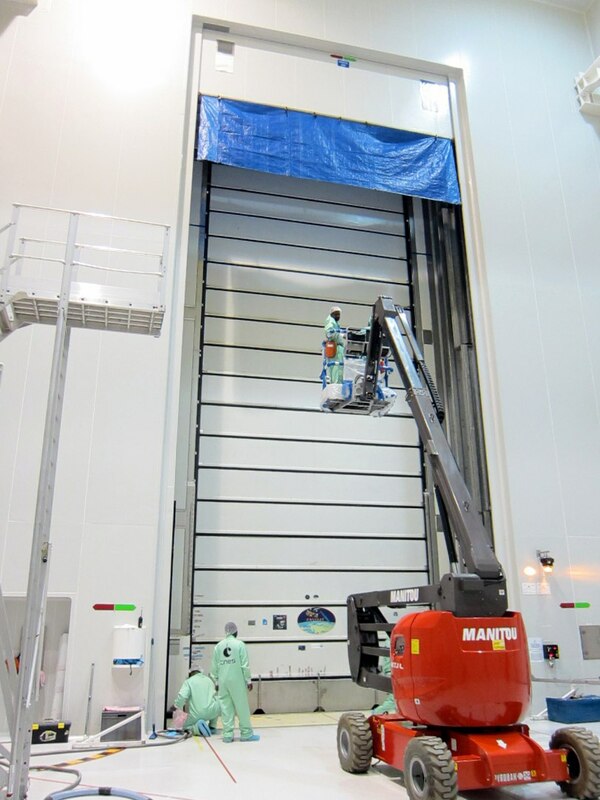 Following its journey, the exterior door of the container had to be cleaned again to avoid contamination of the cleanroom. 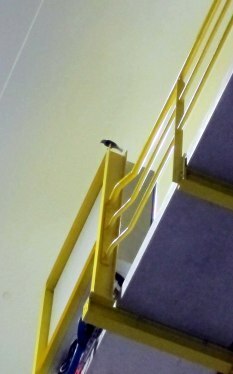 During this time, we had an unexpected guest in the airlock: a bird. Obviously there was no question of allowing him to fly around any way he liked, and he was certainly not getting a flight on a satellite! After 15 minutes, we succeeded in getting him to go into an adjacent corridor. 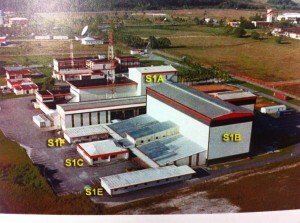 The door of the container could then be opened. After this, the satellite on the base of the container was rolled into the cleanroom. On Saturday 30 November, Gaia was installed on the “propulsion trolley”, allowing for fuelling to begin from Monday 2 December. 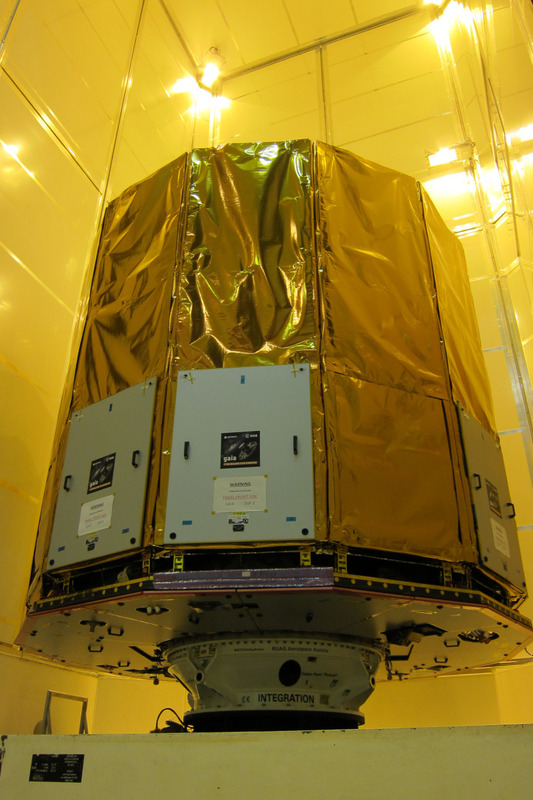 This post was originally written in French by Isabelle Desenclos, Quality Assurance engineer on Gaia at Astrium Toulouse. 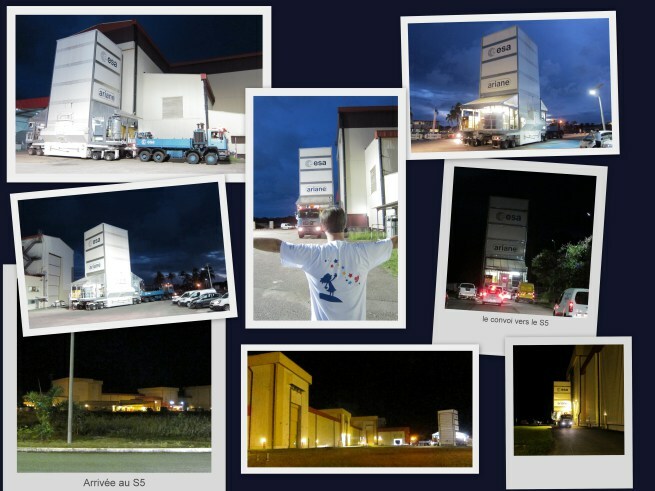 The full version of this post in French is available in her personal blog. Thank you for sharing, Isabelle!